Weighty Matters: Captain America runs on Dunkin'? And here I thought Captain America was supposed to be a super hero. Turns out he's a super shill. 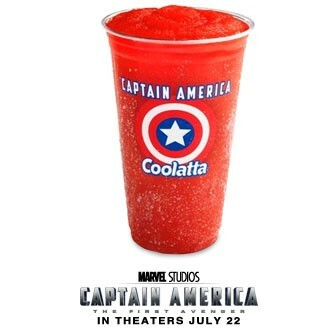 Dunkin' Donut's "Captain America Cherry Coolata"
Grab a large like the Captain America in the advertisement, and you'll be grabbing 480 calories, and 30 teaspoons of sugar. That's more calories than a McChicken Sandwich, and the sugar equivalent of 3 cans of Coca Cola! If America wants to run on Dunkin', they'd better run a lot!